Summertime, well even winter time, or anytime for that matter is perfect for a family camping trip. Don’t we all love the fishing, hiking, or just relaxing by the campfire. Camping is the ideal way to relax, have fun, and become one again with nature while enjoying some fun outdoor activities. There is no second to it, camping whether it is at the beach, in the woods, or even just in your back yard, is a fun way to relax and offers you a change in scenery. After setting up your tent and packing everything out the only thing you need is to relax by a campfire, drink in hand, on a comfortable chair. The surrounding landscapes and fresh air will evoke a feeling of true happiness and a release of stress. The fresh air alone increases serotonin levels, improves your blood pressure, aids in digestion and boosts your immune system. You are away from daily stress and can relax and unwind. You will sleep much more soundly and wake up refreshed and energized. You can socialize with your family or friends away from screens and technology. You get to enjoy some good food and barbecue. The sun increases your Vitamin D uptake, helping with the absorption of calcium and phosphorous for strong bones and teeth. You get to break away from the chaos of life and all your responsibilities for w while. The solitude helps you to maintain clarity, and in many ways can aid in better decision making. My favorite reason is, you get some time to think, think about what is important in life with a clear and relaxed mind. You can use stumps and rocks and whatever you may find, but nothing quite compares to a comfortable and convenient camping chair. First of all a camping chair is a versatile piece of comfort equipment, you might want to use it for other occasions such as picnics, to the beach, or a barbecue at your home. Make sure it can live up to all these requirements. Any camping chair should be portable, lightweight and easy to fold, transport and store. Next in line, keep in mind the weight capacity that your camp chair needs to hold when you are lounging in it. Comfort features such as padding, different recline positions, a cup holder and storage pockets all come in handy. The frame should be durable and the material durable as well as weather resistant, particularly to the sun. Lastly, make sure it is the right size for your body. Insulated storage or cup holder to keep snacks and drinks cool. A tray with cup holder you can use for snacks or eating on. A UV protecting hood or umbrella. A footrest that is detachable or adjustable. Handy storage bag you can carry on your back. Bottle opener or other built-in gadgets. Quick drying seats and back. 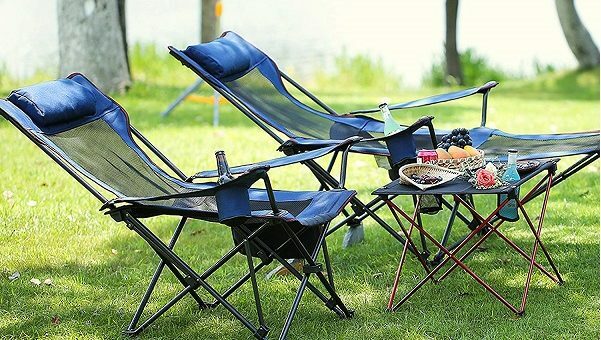 Your perfect camping partner, the Oniva Picnic Time Reclining Camp Chair is comfortable and durable, as well as easy and lightweight to carry around in its nifty included carry bag. 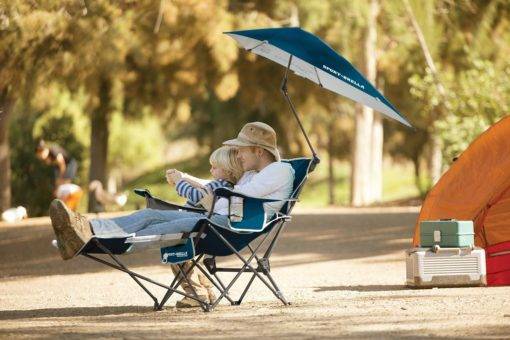 A portable reclining camping chair that comes with a matching storage tote bag with a durable carry strap. Lightweight, with a sturdy and durable frame, and a comfortable padded seat and backrest. Features three recline positions and a durable polyester exterior that will not deteriorate in the outdoors. Easily foldable for storage and can hold up to 300 pounds in weight. The armrests are adjustable and there is a handy insulated cup holder, and side storage pockets for your further convenience. Truly the best choice you can make when it comes to camping recliners, the Zero Gravity chair offers you all the comfort and convenience features you will ever need in a tough and durable, UV resistant chair. Perfect for camping or even just on your patio. A very sturdy frame with a black finish and UV-resistant mesh material cover that is made to last outdoors. A smooth and lockable reclining system which reclines evenly into a Zero Gravity position, along with replaceable elastic cords, which contours to the shape of your body. A convenient and handy tray with cup holder that is easily detachable. This chair is fully foldable and portable, ideal for camping trips, picnics and summer holidays at the beach. This is the ideal chair for hiking, picnics, camping, you name it, particularly when you need to carry your chair a distance. The Camp Solutions Reclining Chair is extremely lightweight and one of the most easily portable camping chairs that you will find. Features a very large and comfortable reclining seat with a built-in headrest and footrest. The breathable mesh cools you down and is highly durable. There are built-in mesh cup holders and the armrests are the ideal height to relax your arms on. Very easy to use and set up, and can hold up to 300 lbs in weight. Durable with a high-quality steel frame that is super lightweight along with the mesh fabric seat and backing. Included is a handy carry bag for easy transportation. There is nothing I love more than going to the beach, and I know finding the perfect spot on the beach takes some walking, sometimes very likely in windy weather. The Strongback Low G chair is the perfect shape and size for the beach so that you can lounge, feet in the sand, and it is highly portable and lightweight. A lightweight and a durable little beach chair with a dual reclining position option. The integrated frame is very sturdy and comfortable offering good lumbar support and can handle up to 300 pounds in weight. More comfort with the standard slingback design that is very easy to fold and pack away in its handy carry bag with back-pack style shoulder strings. The chair likewise includes a built-in beverage holder, what more could you ask for, for a day on the beach! Available in a Grey frame with either, green, black, or blue fabric seat and backing. The Kamp Rite Three Position reclining camp chair is highly durable and weather resistant, as well as easily adjustable and foldable, for the perfect camping experience. Covered with a 600D polyester seat and backing, for durability and weather resistance. A 7 inch high back for full back, neck and head support, and three recline positions. The rigid frame is easily adjustable and sturdy. Likewise features a swing away cup holder to keep your favorite beverage easily at hand. Comes in a neutral two-tone blue and beige color. I came across this brilliant camping chair, and I must say it completely blew my mind, so many excellent and handy features. This is the perfect chair not just for camping, but to take to sports events, the pool, or even the beach. Very comfortable with three adjustable recline settings and a detachable footrest for the ultimate in relaxation. The umbrella part offers full coverage and up to 50+ in UV protection. The canopy has a three way swivel setting and metallic undercoating for further UV protection and eye protection. The built-in insulated cup holder and storage pocket, allows you to refreshment at your fingertips. The zippered storage pocket comes with a very accessible bottle opener. The entire chair is fairly lightweight for its size, strong, and easy to store and fold away. It is manufactured from strong and durable steel that can hold up to 250 lbs in weight. There is a easy to carry storage bag for transportation and storage. I have made sure to choose some models in camping recliners that are both lightweight and versatile, so that they are easy to handle and portable. Each of these unique chairs has features that will come in handy for camping, picnics, or just relaxing on your patio.